Pop Quiz! 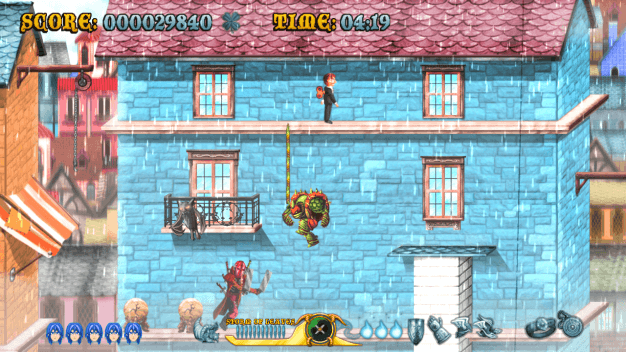 Question: What do games like Contra, Metal Slug, Demon’s Crest and Ghouls ‘n Ghosts all have in common? Answer: They are all awesome run n’ gun games that bring back sweet, sweet memories of the late 80’s and 90’s. Cast of the Seven Godsends is such a game! The story of Cast of the Seven Godsends is a classic one; you play as Kandar, the ruler of the land of Dareca. Kandar’s infant son, the heir of the kingdom, has been kidnapped by the evil emperor Zaraaima. Unfortunately, Kandar dies trying to protect his son. Fortunately, he gets revived and goes on a quest to defeat the emperor and save his son. But he doesn’t do it alone. To help him on his quest, the gods of the land not only revive Kandar, but loan him their power as well. Each god represents a natural element of nature. With their aide, Kandar is able to invoke the power of the seven legendary suits of god-like armor. Each set of armor gives Kandar the ability to use attacks unique to its respected element. 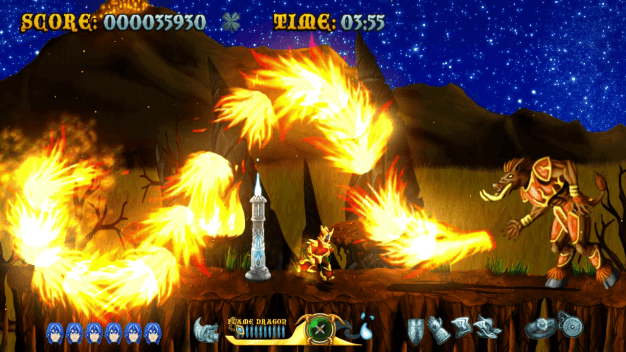 Kandar’s super ability – an enemy incinerating combat spell – in action. There are five weapons Kandar can use throughout the game and each weapon functions differently depending on the suit of armor Kandar is currently wearing. That means there are a total of 35 different weapon attacks usable throughout the game. Not only that, each weapon also gives Kandar a “combat spell” specific to that armor. These combat spells are essentially screen wide attacks that should only be used when things hairy. With such a variety of attack options, fighting in Cast of the Seven Godsends never got old. I would just switch armors whenever I got tired of using the same attack, which happened often. Some of the suits also had additional abilities which gave the game a bit more depth. For example, the earth armor has a vine it can shoot skyward and pull itself up to any platform it touches. Borrowing a move from Poison Ivy’s playbook. Cast of the Seven Godsends is anything but easy. You wouldn’t think that with just an “Attack” and “Jump” control scheme, but when enemies are surrounding you from all sides, you really have be careful. 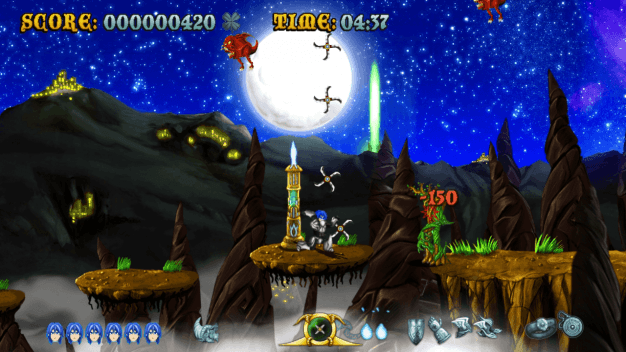 Each level has a mid and final boss as well. The bosses are no joke. By far some of the hardest bosses I’ve fought in a while. But don’t take my word for it. I found a trailer that shows off just how terrifying the bosses can get. Those weren’t even the worst of the bosses. So the challenge is real in Cast of the Seven Godsends. If you laugh in the face of hard, 2D action shooters, Merge Games gives you the option of increasing the difficulty rating. On the flip-side, if you find the game too difficult, there is a “God Mode” option that can be turned on to make yourself invincible. But try it on normal first. A huge downside however is that I beat this game in less than two hours. It is incredibly short with only six different levels to play on. But there is an element of replayability. Cast has multiple endings that can be unlocked as well as several Easter eggs to be discovered. The price is reasonable too, you can pick it up on Steam for only $6.99. A great price for a game that allows all of us to remember just how much fun gaming was when all you could do was jump and shoot.